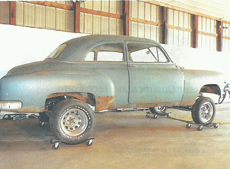 These are the members cars that are currently being raced with the Nostalgia Gassers Racing Association. 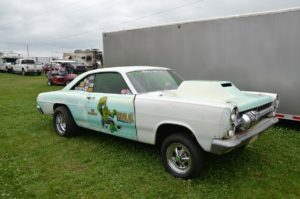 Some of our members also have other old gassers that can no longer be raced & have been retired. You can see these in the retired section. The retired gassers are still brought out for display from time to time. 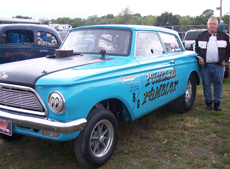 Original Gasser built into a race car in 1959, same owner for 53 years…. Trans: 5 speed yes it has a clutch.. 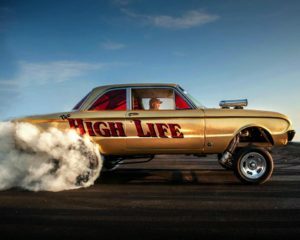 Car: 1966 Rambler 440 American. Motor: AMC 390 .30 over with the following parts. The car was 6 cyl. automatic when I purchased it in December 2009 it just went through a recent restoration. The previous owner was so proud of it, little did he know. mine Rick Abt who did the fabrication. I purchased Henry in 1974 from a Alemeda Ca. wrecking yard for $125. 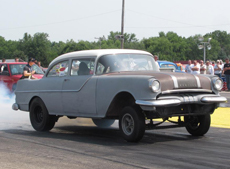 The greatest race was running side by side with Ron Norman and his blue willys through the lights with matching ET’s we both ran 9.87 that was really a fast weekend. 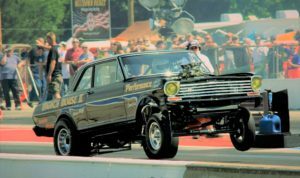 Best Time – 10.40 @ 128 mph Bowling Green Ky.
Time: Injected, 9.18 @ 141 MPH Joliet, Il. Time: 9.51 @ 138 with last years engine! Stay tuned!